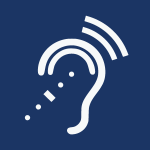 The following is a beginning list of hearing-related resources with relevance to congregations. Answers to basic questions from healthyhearing.com. An introduction to induction loop technology from Technologies for Worship Magazine. Hearing loops are rapidly becoming the preferred technology built into newer hearing aids and cochlear implants. Sometimes called “inductive loops,” they broadcast directly to hearing aids equipped with a telecoil. This site gives you good introductory information on hearing loop technology. See also this radio interview with David Myers by NPR Science Friday host Ira Flatow.